The rapid growth in data center throughput has brought about the increasing usage and demand for higher-performance servers, storage and interconnects. At present, 10 Gigabit Ethernet is highly popular with modern data center. When selecting an appropriate 10 Gigabit physical media to construct 10GbE network, two broad categories of copper and optical fiber will be considered as a result. In this article we are going to explore these two options for 10 Gigabit Ethernet: 10GBASE-T copper network vs 10G SFP+ fiber network and compare their main features to provide you with overall understanding. 10GBASE-T is the standard technology that enables 10 Gigabit Ethernet operations over balanced twisted-pair copper cabling system, including Category 6A unshielded and shielded cabling. It is the technology that provides end users with cost-effective media to achieve 10Gbps data rates. 10GBASE-T offers relatively great flexibility in network design due to its 100-meter reach capability. 10GBASE-T copper equipment includes 10G core Gigabit Ethernet switch, access switch with 10G uplinks, and 10G network interface cards for servers and storage devices. In order to build a 10GBASE-T copper network, there are generally two cabling solutions: 10Gb copper switch with Cat6 cable or 10GbE SFP+ switch with 10GBASE-T SFP+ transceiver. Apart from copper network option, SFP+ modules and the matching fiber cables are needed to connect 10GbE switch over 100m to achieve 10G Ethernet operation. SFP+ direct attach cable (DAC) is a fixed assembly that is purchased at a given length. 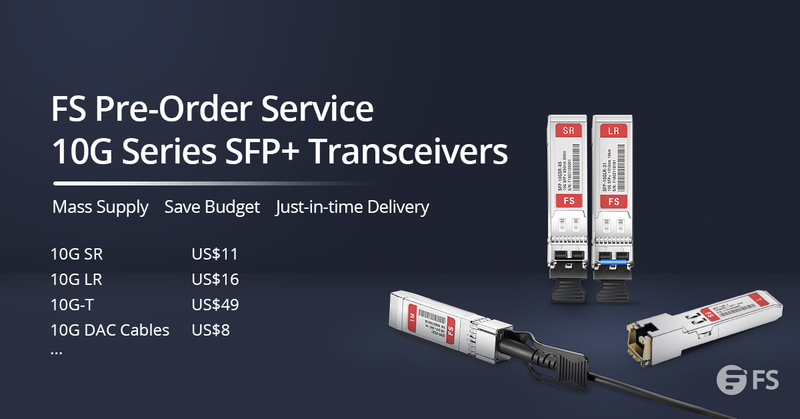 SFP+ DAC provides high performance in 10Gb Ethernet network applications by using an enhanced SFP+ connector to send 10Gbps data through a pair of transmitter and receiver over a thin twinax cable or fiber optic cable. It is a low cost alternative to traditional fiber and twisted-pair copper cabling in data center deployments. For 10GBASE-T copper vs 10G SFP+ fiber, which one would you prefer to? As grid company restricts the power supply to data centers, data center managers yearn for the lowest power consumption possibilities. 10GBASE-T components today require anywhere from 1.5 to 4 watts per port depending on the distance of the cable. While SFP+ interface that has been widely applied for 10 Gigabit ToR switches requires approximately 1 watt per port regardless of the distance. In addition, 10G SFP+ offers better latency with typically about 0.3 microseconds per link. 10GBASE-T latency is about 2.6 microseconds per link due to more complex encoding schemes within the equipment. When comparing 10GBASE-T technology with the alternative SFP+ technology, it is obvious that SFP+ is the more appropriate technology to ensure optimal performance with lowest power consumption and latency in data center. With Cat6 cables becoming less expensive than fiber cables and SFP+ 10G copper cable, the cost of 10GBASE-T copper technology has been declined in the past years. In the meanwhile, it maximizes the utilization of existing copper structured cabling, so it will save much capital expenditure as well. What is more, 10GBASE-T is given the advantages of being an interoperable and standards-based technology that uses the familiar RJ45 connector. Therefore, it can provide backwards compatibility with legacy networks. However, SFP+ fiber solution is limited with little or no backwards compatibility. When you have to choose between 10GBASE-T copper option and SFP+ fiber option, the decision should be based on your need. For equipment that power consumption and lower latency are crucial, SFP+ might be more suitable. For cost and flexibility are more vital, 10GBASE-T will be more preferred. If you are looking for 10G data switch, also called 10 Gigabit Ethernet switch to build your network, FS could provide with copper and fiber choices. Ethernet Network 10 Gigabit Ethernet, 10G SFP+ fiber, 10Gb copper switch, 10GBASE-T copper, 10GbE SFP+ switch. permalink.